Thanksgiving has a rich and complicated history, but at the core of our modern Thanksgiving Day is Sarah Hale, without her influence we would likely not have Thanksgiving Day. Sarah had a difficult and trying life. She had lost her husband and had 5 children to feed, (all of them 7 years or younger) so she earned money by writing. Her first major success was a book titled Northwood. Which had an entire chapter dedicated to a Thanksgiving at the protagonist's house. Another of Hale's noteworthy additions to American culture is the poem Mary Had a Little Lamb. 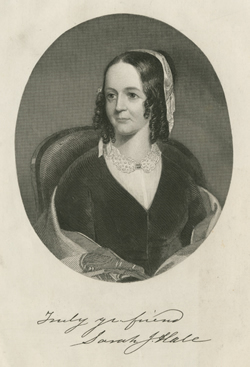 Sarah Hale has had significant influence on the social life of Americans. She campaigned relentlessly for a national Thanksgiving for almost 40 years. Writing thousands of letters to state and territory governors to proclaim Thanksgiving Day on the last Thursday of November. She was so influential that she has been given credit for single-handedly convincing President Lincoln in 1863 to produce the first presidential thanksgiving proclamation in the unbroken tradition of observance. The Thanksgiving Sarah Hale described and proposed was a mixed holiday of the current religious ideals with all the festivities of the English harvest festivals. Her idea was to create a holiday that not only copied God's Holy Days, but actively absorbed those from other religions. She actively preached of syncretism1 between Thanksgiving and God's Holy days. Before we look at the exact words Sarah Hale wrote about Thanksgiving, we need to understand the vast influence she had over the country's culture. Here is a piece written about Sarah Hale from the book Thanksgiving An American Holiday, An American History, written by Diana Applebaum. The success of Northwood led to a job as editor of the Ladies' Magazine in Boston, one of the earliest women's magazines and the first to be edited by a woman. In 1837, the Ladies' Magazine merged with the Lady's Book of Philadelphia, and Mrs. Hale became the editor of the new Lady's Book and Magazine, published by L. A. Godey. Mrs. Hale was the leading instigator in making the Thanksgiving Day holiday what it is today. The origins of Thanksgiving Day cannot be fully discussed without acknowledging the influence of Sarah Hale. Each year Mrs. Hale wrote a rhapsodic editorial on the desirability of a national Thanksgiving Day. November issues of the Lady's Book featured Thanksgiving Poetry and stories of families reunited on Thanksgiving Day. Household advice columns carried directions on how to stuff a turkey and bake a mince pie. Mrs. Hale intended to tell her readers about Thanksgiving and teach them to celebrate it until the holiday became as familiar a household custom in Mississippi and Nebraska as it was in New Hampshire. This idea made practical political sense. Lincoln (like his Confederate counterpart, Jeff Davis) was having difficulty maintaining authority over some governors. State sovereignty was asserted as the armies of both North and South were recruited and marched proudly under state flags. Needed to rally war-weary citizens was some act of nationalization, a symbolic tightening of the bonds of unity. Lincoln seized the opportunity presented by the “editress” (a formulation that never caught on) to draw Americans together on both national and religious grounds. The moral purpose of Lincoln's uncharacteristic religiosity was to unify deeply divided Americans around an event already steeped in tradition and reflecting a common spiritual value. His political purpose in nationalizing Thanksgiving Day, making it the same day throughout the country, and “set apart” (evoking the phrase chosen by George Washington) by the nation's president, was to emphasize the symbol of central authority. Both the moral and political purposes were well served at the time the Union was in peril of being sundered.